Upcoming Events | Leeds Arts Council, Inc.
Emma Carter Brooks is the Leeds Arts Council’s featured artist in March. The public is invited to the opening reception on Sunday, March 3, 2019, 1:30pm – 3:30pm to view her beautiful photographs of still life and Alabama landscapes. Admission is free. Emma is a lifelong resident of Leeds. Photography became her passion after an early retirement from Blue Cross and Blue Shield of Alabama. In her pursuit for peace in the midst of pain, Emma found it behind the lens of a camera in 2007. “I believe everything was created by God and given to us to enjoy and respect. “Art by I AM” is my signature name because He is the author and creator of all the images that I capture. He’s the master of the piece and therefore, I give him all the glory,” says Emma. Emma is the author of Southern Quotes. She is a member of the Alabama Wildflower Society, Leeds Arts Council, Friends of the Leeds Library, Turkey Creek Nature Preserve, and the Sierra Club. She has dedicated many volunteer hours to helping keep the city of Leeds clean. She also organized the Leeds and Moody Police appreciation in 2016. Emma continues to travel throughout the southeast to capture the beauty of God’s glory. The 39 Steps is a comedy based on the characters from the 1915 John Buchan novel and the 1935 Alfred Hitchcock movie, but handled in a Monty Python style, with actors performing multiple roles. The script was developed by Simon Corble and Nobby Dimon and adapted in 2005 by Patrick Barlow. The script is full of allusions to other Alfred Hitchcock films, including Strangers on a Train, Rear Window, Psycho, Vertigo, and North by Northwest. Performance dates are: February 15, 16, 22, 23 @ 7:00 pm and February 17, 24 @ 2:00 pm. Directed by Suellen Wilkins with Brian Allison as Richard Hannay; Susan Cook as Annabella, Margaret, and Pamela; Stacy Lowery and Ron Landry are the two Clowns; Curtis Frost, Johnny Underwood, Lori Franks, Tommy, Wendy & Gracie Riley all pitch in to add to this comic mayhem! 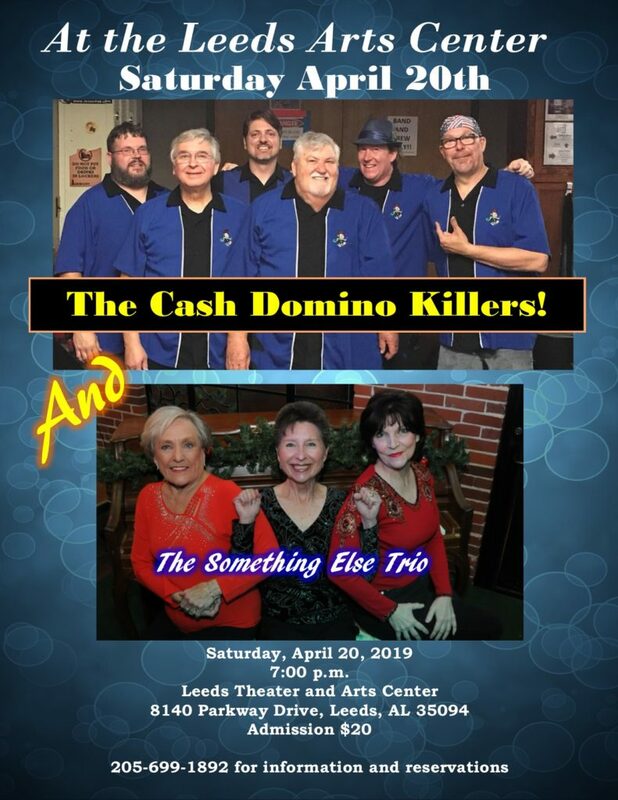 The Leeds Theater and Arts Center – A Fun Place To Be! The Leeds Arts Council will honor the Leeds High School Artists with an opening reception on Sunday, February 3, 2019, from 1:30 to 3:30 pm at the Leeds Arts Center. The public is invited to meet these talented artists and enjoy their beautiful and varied works. Admission is free. Participating artists include Scott Adams, Jade Cifalo, Evan Cole-Tyson, Jasmine Cooper, Rebecca Denno, Raven Dozier, Jackson Harrigan, Brooke Kilgore, Lydia LaCruz, Bayleigh Ledbetter, Mackenzie Lockridge, Jackie Martinez, Jocelyn Martinez, Jay Megehee, Noah Peace, Gyrani Rogers, Hayden Underhill, and Isabella Weldon. These high school artists work in a variety of mediums and styles. Their works reflect their interest in nature, pop culture, music, humor, and everyday life. Their art will be on display through March 2. For more information regarding the reception, exhibit, and other Leeds Arts Council events, visit http://www.leedsartscouncil.org In case of inclement weather, call the arts center at 205-699-1892 to confirm opening hours. On Monday, Jan. 14, 2019, a vote will be taken by the Board of Directors to amend the Leeds Arts Council bylaws. The Leeds Arts Council will honor the Leeds Area Visual Artists with an opening reception on Sunday, September 9, 2018, from 1:30 to 3:30 pm at the Leeds Arts Center in downtown Leeds. You are cordially invited to meet our talented local artists and enjoy their beautiful and varied works. Additional art work, prints, cards, and books will be on display and available for purchase in the theater during the reception. Admission is free. Participating artists include Ramey Channell, Nancy Cole, Nelda Faulkner, John Gregory, Jonathan Harris, Scott Harvey, Tina Miller, Grady Sue Saxon, and Sherry Whisenhunt of Leeds and William Darby, Tanna Rose, and Cindy Schmidt of Moody. These local artists work in a variety of mediums and styles. The exhibit comprises oil, acrylic, watercolor, and mixed media paintings; graphite and pastel drawings; and photographs. LAVA’s art will be on display through November 3. For more information regarding the reception, exhibit, and other Leeds Arts Council events, visit http://www.leedsartscouncil.org In case of inclement weather, call the arts center at 205-699-1892 to confirm opening hours. The Leeds Arts Council is excited to present our 2018 Summer Musical “Hunchback of Notre Dame,” a new musical based on the Victor Hugo novel and songs from the Disney film. The show dates are July 13, 14, 20, 21, 27 and 28 at 7:00 pm and July 15, 22 and 29 at 2:00 pm. 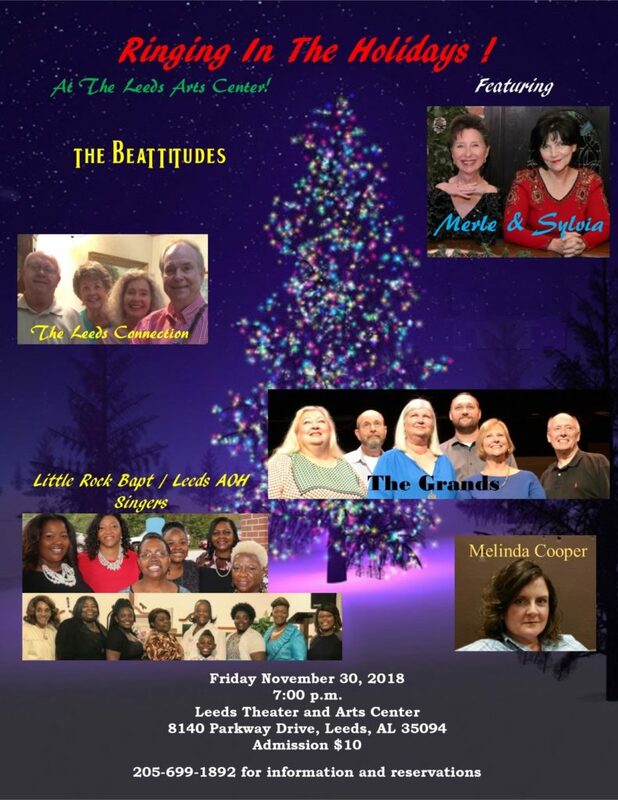 All tickets are $15 and may be purchased by calling 205-699-1892. Leave a message and someone will return your call to confirm your reservation. The show is appropriate for children fourteen (14) and older. The theatre is handicapped accessible. Please let us know if special seating is needed. “Hunchback of Notre Dame” follows the disfigured Quasimodo, the bell ringer of Notre Dame Cathedral, who bides his time locked away in a tower. With only gargoyles to keep him company, he longs to be a part of the festival, as all of Paris is reveling in the “Feast of Fools”. He manages to escape the tower and enters the boisterous crowd, only to be treated cruelly by all but the beautiful gypsy, Esmeralda. Quasimodo isn’t the only one captivated by her free spirit though – Captain Phoebus and Frollo, Quasimodo’s adoptive parent, are equally enthralled. As the three vie for her attention, Frollo embarks on a mission to destroy the gypsies and it’s up to Quasimodo to save them all. This sweeping score and powerful story is the retelling of Victor Hugo’s epic story of love, acceptance and what it means to be a hero. Come and share the magic of this truly unforgettable musical. Starring: David Pohler as Quasimodo; Jalen J. Brown as Phoebus; Cliff Keen, Jr. as Dom Claude Frollo; and Kaylee Ramey as Esmeralda. Co-starring: Bill Allen, Michael Allen, Chelsea Blackmon, Ty Davis, Clark French, Kelly French, Sean Frost, Sage Gardner, Annaleigh Holloway, Steve Halsey, Julia Jones, McKenzie, Ramey, Ashley Richardson, Gracie Riley, Tommy Riley, Wendy Riley, Stacy Ross, Carrie Self, JD Short, Harper Soilleau, Zak Taylor, and Beth Vaughn. Produced by Sandi Nicholson and directed by Cliff Keen, Jr.
Hunchback of Notre Dame is presented through special arrangement with MUSIC THEATRE INTERNATIONAL (MTI). All authorized performance materials are also supplied by MTI.